If you’re writing for a website, I normally expect you to have an email address with an @domainname.whatever at the end of it. But, if you don’t have one, it would be helpful to have a managing editor or EIC cc’d on the email to confirm your identity or at least be able to verify the email address on the staff page of the website. If your channel is on YouTube, Twitch, Mixer, or elsewhere, I’d expect you to email from your email address visible on the channel. Doing this removes the step of verifying your identity before doing what I can to help you out. Here’s a hypothetical example of why I have to verify an identity in an email. I’ve received emails with all kinds of stats about readership and viewership, but there wouldn’t be even a small mention of what or how they cover games. This is even tougher with some YouTube and Twitch channels, because we look to see what games you play. If you’re a YouTuber who mainly covers PlayerUnknown’s Battlegrounds but occasionally has special videos for other games in the shooter genre, it really helps to point that out. This can be even more crucial for people on Twitch and Mixer where archived videos can be even more temporary. 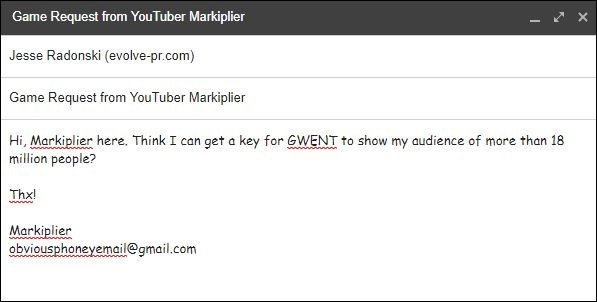 If your website or channel covers specific subjects such as VR or Horror games, definitely mention that because if you’re reaching out for SUPERHOT VR or Observer, that might be what encourages us to get you a key for the game. An example of someone who boasts large numbers but pretty much only plays one game. As someone who writes emails professionally, I know when I’m looking at an email that isn’t personalized. The most blatant ones are where I can tell he or she literally copied and pasted some boring, universal description about his or her website then entered the game name in the middle of it, but the copy is in one style of font while the game name is in another. Even worse would be if the name of the game being requested is left out altogether! You wouldn’t believe how often I see these types of emails. While some information about your website will always be the same from pitch to pitch, at least take a moment to personalize something outside of the game name. Again, if your coverage would fit well with the theme of your website or channel, that’s a wonderful thing to mention here. Also, if English isn’t your first language, I’m not going to hold that against you. You’re more than welcome to write in your native language if that would help you be more confident in your writing. Gmail can usually translate an email, or I can totally take a moment to run it through a translation tool. I know Bryden likes going to see live music, so I began with something more personal. Now, just so you’re aware, common practice at Evolve PR is to encourage media to sign up for an account on Terminals. This usually helps us confirm the general information of who you say you are, if we aren’t already on familiar terms, but we’re happy if you to reach out through email or the internal messaging system in Terminals if there’s a specific focus on your website or channel that we don’t immediately notice. 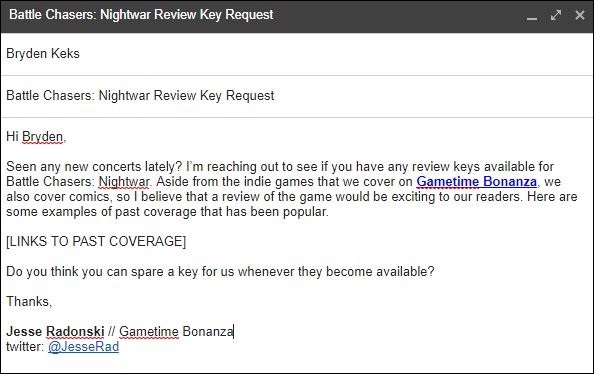 You can even add those to the notes when you’re requesting a key for a game – we do read them. Hopefully these tips are helpful for any pitch emails you’re sending to people, not just to us here at Evolve. Did I miss anything? Add it to the comments or hit us up on our social channels.